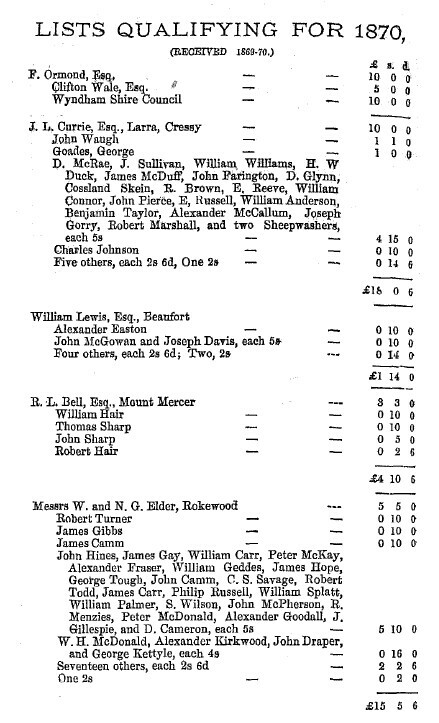 The Annual Reports of the Geelong Infirmary & Benevolent Asylum are an amazing source for locating those ordinary ancestors. Each report includes an extensive list of subscribers [an early version of Medicare for the use of the Infirmary]. They are particularly useful for country areas although there are many employees grouped by employer in Geelong. Larger property owners in the Western Districts ensured their workers were covered for admission to the Geelong Infirmary. They won’t always list every worker but they are certainly a good starting point. The Larra Run, also known as Geelengla Run was held by John Lang CURRIE and Tom ANDERSON from August 1844 to March 1848, then solely by CURRIE until June 1867. Larra was a 32,000 acre run near Camperdown on which CURRIE developed his award-winning and world-renowned Merino flock. John WAUGH, George GOADES, D McRAE, J SULLIVAN, William WILLIAMS, H W DUCK, James McDUFF, John PARINGTON, D GLYNN, Cossland SKEIN, R BROWN, E REEVE, William CONNOR, John PIERCE, E RUSSELL, William ANDERSON, Benjamin TAYLOR, Alexander McCALLUM, Joseph GORRY, Robert MARSHALL and two Sheepwashers, Charles JOHNSON, and 5 others. If any of these was an ancestor I’m sure you’d be delighted to confirm where they worked at the time. A word of warning – as it appears many of these names were transcribed from hand-written lists, you will need to be creative with the spelling! However, once you’ve found a person of interest, it’s a simple matter of searching reports in earlier and later years to narrow down the years they may have worked on that property or for that employer. You may not find any mention of these people in other records so these reports and lists are a real bonus. Next 1.5 million records in Geelong District database! Hi Suzie, if you are on Facebook the Camperdown Historical society would be great to get a link up to this article and maybe Mortlake too, many people from the district are on these Facebook pages and links may be found!!!! Hi Cindy – feel free to share or pass this on … Geelong & District Facebook page is https://www.facebook.com/GeelongandDistrict and barring technical hiccups, these Blog posts are automatically posted on the G&D Facebook page.